* The Wheelmobile event will take place inside the former Best Buy store located on the East end of Hunt Valley Towne Centre. The best parking access for the event will be on the Southeast and Northeast sides of the Hunt Valley Towne Centre parking lot. Doors will open at 10 AM for each event day. After the Wheelmobile event in your area has been conducted, we will choose the people we believe will be the best candidates for the show (based on their overall performance on stage) to take part in a final round of auditions. These final auditions will take place in the Baltimore area within a few months after our last event date. We will get as many people up to the stage as we can. 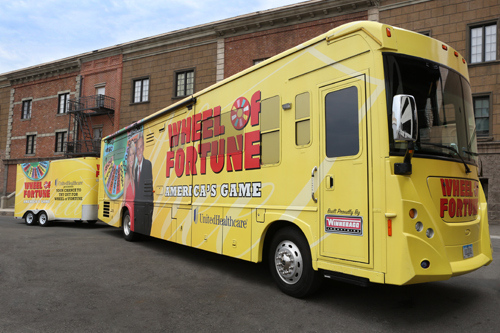 However, we know there will be many more folks at our Wheelmobile events than we can possibly audition. For this reason, we will reserve some slots in the final auditions for those individuals who attended Wheelmobile events but did not make it up to the stage. After all the Wheelmobile events have been conducted, we will draw a number of names at random from all the applications we receive in the Baltimore area for these slots. You are not eligible to be a contestant on Wheel of Fortune if you work for, or are related to, anyone who works for Sony Pictures Entertainment Inc., Sony Pictures Television Inc., Sony Pictures Television International, Quadra Productions, Inc., CBS Television Distribution Group, game show prize suppliers, WBFF-TV (including its advertisers and affiliated radio stations), or any TV stations or networks broadcasting Wheel of Fortune or Jeopardy!. A contestant audition does not guarantee a spot on the show. The applicant understands that Wheel of Fortune is under no obligation to use him/her as a contestant. It is entirely at the producer’s discretion. WATCH WHEEL OF FORTUNE WEEKNIGHTS AT 7:30 PM ON FOX 45.